Francis (Frank) J. Lafferty, IV joined Moore Ingram Johnson & Steele in 2018 and is currently a member of the Firm’s Litigation Department. His practice is focused primarily in the area of Workers’ Compensation. 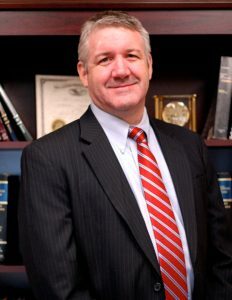 Frank earned his law degree in 1999 from Widener University School of Law and received his undergraduate degree from the University of South Carolina-Aiken in 1990. Prior to joining Moore Ingram Johnson & Steele, Frank was a partner at two Central Pennsylvania law firms where he focused his practice in the area of Workers’ Compensation. In that capacity, Frank has over fifteen years of litigation experience and has represented clients at all levels of the Workers’ Compensation process. Frank’s experience in trial work, mediation and arbitration, and diligent case preparation are all hallmarks of his practice. In addition to extensive experience before Workers’ Compensation Judges across Pennsylvania, Frank has argued cases before the Pennsylvania Workers’ Compensation Appeal Board, the Commonwealth Court, and the Pennsylvania Supreme Court. Community service and pro bono representation both are important to Frank’s career. He has taught trial advocacy at Widener University School of Law’s Intensive Trial Advocacy Program (ITAP), and has participated in the Mentor/Mentee program for Widener University. He also has enjoyed the experience of volunteering for the activities of his two children as a little league coach for the Mechanicsburg Little League Association, and soccer coach in both Mechanicsburg and Camp Hill. By submitting an inquiry through our website, no attorney-client relationship is created. An attorney-client relationship will only be created after speaking with and formally retaining an attorney in our firm who verifies in writing that he or she is handling your legal issue.